Station Hollywood: Jaikishan and Rafisahab cannot be forgotten. Jaikishan and Rafisahab cannot be forgotten. Jaikishan Dayabhai Panchal is remembered on 12th September and 4th November, his death anniversary in 2013. The listeners of music all over the world wished happy birthday to legendary composer Jaikishan better known as Jaikishan Dayabhai Panchal on 4th November, 2012. He was part of the legendary duo Shankar Jaikishan who dominated bollwood music during the 1950s and 1960s. Rafi had a very sweet relationship with Shankar Jaikishan but unfortunately their relationship had not been glorified in bollywood history. Whenever contribution of composers relating to classic creations involving Rafi are highlighted the name of Naushad, Roshan, Madanmohan, OP Nayyar are glorified and the contribution of Shankar Jaikishan is ignored. If Rafi’s stylish andaz relating to westernized compositions are adequately it is Shankar Jaikishan who had used it to perfection. They had used Rafi for singing romantic songs with Japanese orchestration in Love in Tokyo including songs like “aja re aa zara aa”, “Japan, Love in Tokyo”, “ o mere shahekhuba”, etc. In Biswajeet’s April Fool SJ’s composition for Rafi including “aa gale lag ja” had westernized background. SJ’s composition for Rafi in Shammi Kapoor’s An Evening in Paris like “akele akele kahan ja rahe ho”, “raat ke humsafar”, had loud French music with echo effect and Rafi’s intonation was also westernized. Shankar Jaikishan gave a completely different style of music to Rafi in Rajender Kumar’s Aarzoo with songs like “aji ruth kar ab”, “chalke teri aankho se”, “ai nargisi mastana”, etc. SJ had given songs addressing children to Rafi including “nanne munne bache teri mutthi me kya hai” in Boot Polish, “hai na bolo bolo”, “re mamma re mamma re” in Shammi Kapoor’s Andaz and “chakke p chakka” in Brahmchari. Rafi pronounced the words with childish accent and SJ used the orchestration to attract children. There were ghazals also given by SJ for Rafi including “rukh se zara nakab” in Jeetender’s Mere Huzoor, “unke khayal aye to” in Raj Kumar’s Lal Patthar, “saaze dil ched de” in Pradeep Kumar’s Rajhaath, etc. Besides SJ’s creation involving Rafi in somber mood had created great impact including songs like “teri zulfon ki judai to nahi maangi thi” in Dev Anand’s Jab Pyar Kisi Se Hota Hai, “ehsaan tera hoga mujhpar” in Shammi Kapoor’s Junglee, “yaad na aye” in Rajender Kumar’s Dil Ek Mandir. 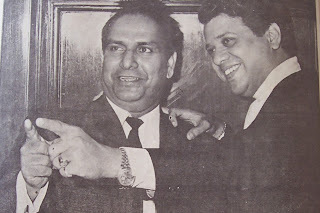 Shankar Jaikishan had used Rafi’s classical andaz in the songs “radheke tune bansoori churai”, “ajahu na aye”, etc., and combined the ragas with devotional andaz. SJ had given music in almost 200 films within the span from 1949 to 1971, and at least each year they composed music for approximately 10 films. As Rafi was given predominance over other male singers SJ had use him in regular intervals even without doing injustice to Mukesh, Manna Dey, Kishore Kumar, Talat Mehmood and others. Songs like “kaun hai jo sapno me aya” from Jhuk Gaya Aasman, “to bura maan gaye” from Ayee Milan Ki Bela, “yeh ankhen” from Jab Pyar Kisi Se Hota Hai, “tujhe jeevan ki dor se” from Aasli Nakli, “dheere dheere chal” from Love Marriage, “badan pe sitaren lapete hue” from Prince, “mai kahin kavi na banjayun” from Pyar Hi Pyar, “mai gayun tum so jao” from Brahmchari, had not lost their flavour even 40 years after their creation due to sheer brilliance of Shankar Jaikishan. It is really tragic neither Shankar Jaikishan had received the accolades that they deserved nor Rafi’s association with them had been glorified but history says that the combination of Rafi with Shankar Jaikishan had produced invaluable creations which had become immortal over the period of time. Rafi had a dream run in the 60s, mainly in the films of Jubilee Kumar, Rajender Kumar for more than a number of reasons. Firstly Rajender Kumar acted in the production and direction of biggest banners of bollywood in the 60s. Secondly from 1963 to 1966, all his films ended up in silver jubilee showing his immense popularity and strong presence in the box-office. Shankar Jaikishan was equated with God in the early 60s and the main reason of the box-office success of Jubillee Kumar’s films was the superlative music given to him by both SJ and Naushad. In the film Ayee Milan Ki Bela, all the songs of SJ, picturised on Rajender Kumar and sung by Rafi became super hit The immortal songs include “mai pyar ka diwana“, “aha aye Milan ki bela“, “tum khamseen ho“, “to bura maan gaye“, “o sanam tere ho gaye hum“. Rajender Kumar and Saira Banu’s online chemistry in the film helped in the success of the film. SJ’s composition in the film Aarzoo, Humrahi and Sasural for Rajender Kumar and Rafi were equally rich. The brilliant songs include “chalke teri aankhose“, “ae nargisi mastana“, “aji ruth kar ab“, “yeh aansoo meri dil ki zubaan hai“, “teri pyari pyari surat ko“, “mujhko apne gale laga lo“, to mention a few. Sadhna complimented the powerful performance of Rajender Kumar in Aarzoo. The brilliant combination of Rafi, SJ and Rajender Kumar, continued in the film Dil Ek Mandir and Jhuk Gaya Aasman. Prominent songs include “yaad na jaye“, “jahan koi nahi“, “dil ek mandir hai“, “o priya kaun hai jo sapno me aya“, “kahan chal diye“, to mention a few. SJ Rafi and Rajender Kumar continued in the film Aman, where songs like “surahidar garden koel si hi awaz” still mesmerizes the listeners. Rafi, Rajender Kumar and SJ created history even in the film Suraj. The songs “kaise samjhayun“, “chehere pe giri zulfein“, “itna hai tujhse pyar mujhe“, “baharon phool barsao” had become immortal over the years. Rajender Kumar and Vaijayantimala’s screen presence were as majestic as the voice of Rafi and the quality of music of Shankar Jaikishan. The other films where the magic combination of Rafi, Rajender Kumar and Shankar Jaikishan made people speechless include Zindagi and Sangam, with the prominent songs being “pehle milethe sapno me” and “meherban likhoon“. When Shammi Kapoor was informed about Rafi’s death in 1980, he was told by the informer that he had lost his own voice. In other words it was said that Rafi’s voice had reached the soul of Shammi Kapoor, whose success in bollywood films was largely dependent on the golden voice of Rafi. Shankar Jaikishan had contributed in around 22 films of Shammi Kapoor and without the magical duo Rafi’s combination with Shammi Kapoor would not have fulfilled the popular demands of the musical audience. If SJ’s composition for Raj Kapoor mark the music catered to the masses, the composition for Rajender Kumar mark the sophisticated tunes catered towards the cultured audience, the compositions for Shammi Kapoor mark the westernized andaz addressed for the young generations. Shammi Kapoor brought the rock and roll andaz of Hollywood films in hindi films, and SJ and Rafi combined together to bring the energetic andaz of Shammi Kapoor who was considered to be a rebel star in the 60s. In fact his style was imitated by Joy Mukherjee and Biswajeet who were also blessed with melodious songs sung by Rafi in the 60s. SJ, Shammi Kapoor and Rafi combined together to give superhit songs in the film Junglee, including “ehsaan tera hoga mujhpar”, “meri yaar shabba khair”, “chahe koi mujhe jungle kahen”, etc. Saira Banu made her debut opposite Shammi Kapoor and the Subodh Mukherjee film became a trend setter for other directors of producers of the 60s. SJ, Shammi Kapoor and Rafi created the same magic in the film Janwar. Songs like “tumse achha kaun hai”, “lal chari maidan khari” became superhit along with romantic performance of Rajashree in the film. SJ, Shammi Kapoor and Rafi combination in the film Raj Kumar was equally sublime with songs like “hum hai rajkumar”, “tumne pukara aur hum chale ayen”, “tumne kisiki jaan ko”, to name a few. Sadhna was sublime along with Shammi Kapoor in the film. SJ, Shammi Kapoor and Rafi created magic again in the film An Evening in Paris. All the songs of the film became super hit including “aji aisa mauka”, “aasman se aya farishta”, “raat ke humsafar”, “akele akele kahan ja rahe ho”, “mera dil hai tera”, “diwane ka naam to pucho”, to name a few. The foreign locations of Paris were as majestic as the European music of SJ and modernized performance of Sharmila Tagore in the film. The brilliant combination of SJ, Shammi Kapoor and Rafi again created magic in the film Brahmchari. All the songs in the film including “dil ke jharoke me”, “chakke pe chakka”, “mai gavun tum so jayo”, “aajkal tere mere pyar ke charche” created storm in bollywood films. Shammi Kapoor won the filmfare for best actor for his performance in Brahmchari, and Shankar Jaikishan won the film fare for best music director for the same film, while Rafi won the filmfare for best singer for singing the song of the same film. Again Rajashree was sublime in the film. SJ, Shammi Kapoor and Rafi were equally brilliant in the film Prince where Vaijayantimala acted opposite Shammi Kapoor. Rafi’s songs “muqabla hum se na karo” was as hit as “badan pe sitaren lapete hue”. The same combination came up with brilliant songs in the film Laat Sahab. The songs “sawerewali gari se chale jayenge” and “aye chaand zara chup ja” became superhit. Nutan contributed well opposite Shammi Kapoor. The magic combination of SJ, Shammi Kapoor and Rafi contributed even in GP Sippy film, Andaz. All the songs of Rafi like “dil use do jo jaan deden”, “hai na bolo bolo”, “re mamma re mammare” became superhit. Hema Malini performed for the first time opposite Shammi Kapoor. The brilliant combination of SJ, Hasrat Jaipuri, Shailendra, Shammi Kapoor and Rafi ended with sad demise of Jaikishan in 1971. Articles after articles can be devoted on the magic combination who even created magic in other films like Tumse Accha Kaun Hai, Jawan Muhobbat, etc. Critics argue that OP Nayyar and Ravi also contributed in Shammi Kapoor’s films, but their music was also influenced by Shankar Jaikishan’s tunes. The films and the songs of Shammi Kapoor, Shankar Jaikishan and Rafi should be preserved for the future generations. A big section of music lovers agree that had Jaikishan not died in 1971, Rafi’s dominance in bollywood music not suffered at all. In fact SJ’s tunes were brilliant and were specifically catered towards the likings of common mass. They were not that technical which could not reach the audience. Besides SJ gave tunes in around 10 films per years all along the 50s and 60s, the era when Rafi was unbeatable. Happy birth anniversary to Johnny Walker. Happy birthday to Shekhar Kapoor. Happy birthday to Usha Utthup. Happy birthday to Macho Star Dharmender. Happy birthday to Raveena Tandon. Actress Shyama remained immortal in her works. Gayatri Bose songs were very popular in 1950s. Happy birthday to Bappi Lahiri. Happy birthday to superstar Shahrukh Khan. Happy birthday to Juhi Chawla.